TOKYO (Reuters) - When a young Vietnamese woman found out late last year that she was pregnant after arriving in Japan on a "technical trainee" visa, she was given a stark choice: "Have an abortion or go back to Vietnam." "The situation is completely different from what they were told back home," said Shigeru Yamashita, managing director of the Vietnam Mutual Aid Association in Japan. "They have debts they cannot repay with their salaries at home, so the only option is to flee into the black market for labor." 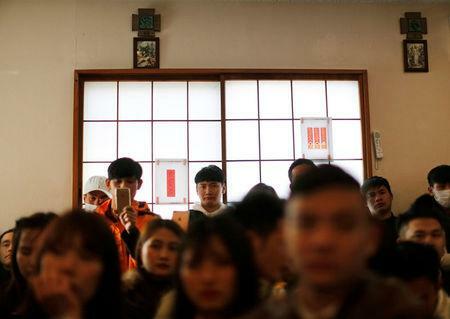 The new law will allow about 345,000 blue-collar workers to enter Japan over five years in 14 sectors such as construction and nursing care, which face acute labor shortages. One category of "specified skilled workers" can stay up to five years but cannot bring families. Immigration authorities will provide oversight of the new foreign workers; the labor ministry's immigration bureau will become an agency on April 1, a bureaucratic distinction that gives it more clout. But Sasaki said the agency's focus would be residence status, not labor conditions. "If there is not a proper framework to accept them and they are thought of as purely a way to fill the labor shortage, for certain there will be major problems," Yuji Kuroiwa, governor of Kanagawa Prefecture near Tokyo, told Reuters.